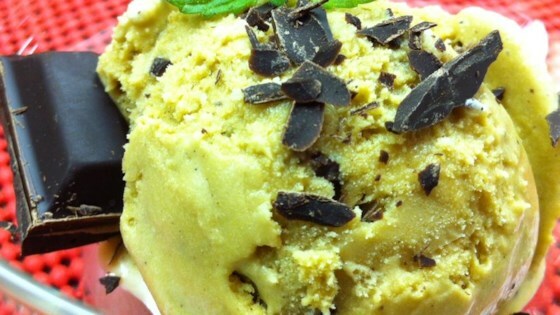 "Yummy ice cream for adults inspired by Philz Coffee®'s Ice Mint Mojito Coffee." Heat milk, ground coffee, 1/4 cup brown sugar, and mint in a saucepan over low heat until warmed through, 7 to 10 minutes. Whisk egg yolks and remaining 1/2 cup brown sugar in a bowl; slowly whisk in about 1 cup hot milk mixture. Pour egg yolk mixture into saucepan and continue to heat until custard is thickened, about 5 minutes. Line a sieve with cheesecloth and strain custard into a large bowl; discard solids. Whisk heavy cream into custard. Cover and refrigerate until chilled, 4 to 5 hours. Stir rum and chocolate into chilled custard and pour into an ice cream maker. Freeze according to manufacturer's directions. Just a note on the amount of rum: alcohol doesn't freeze easily so adding it will make your ice cream more slushy than solid so you might want to lessen the alcohol a bit if you want it more creamy and solid.